This Giant Flash is simply the 1969 summer annual, except that it’s an entire reprint book with no new stories or even stand-alone art pages or features. 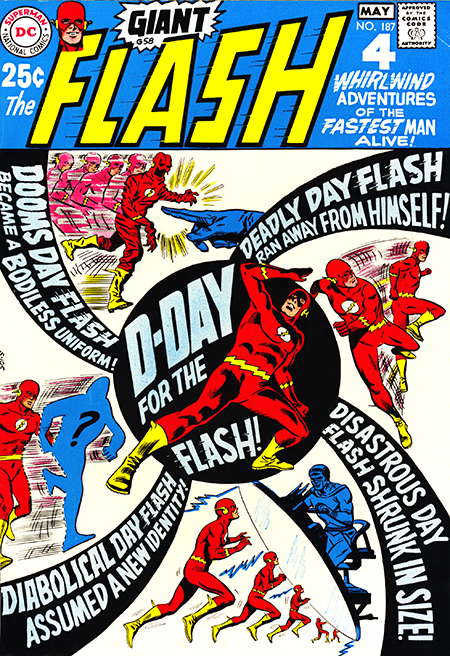 It even eschews the reprinting of a Golden Age Flash story which had been the recent norm. Beautiful art and stories for sure, but we’ve already seen them all. It was a great jumping on point for newbies to the The Flash, and also a great way to catch-up on the schedule for Editor Schwartz and crew. No shame there. When things would start to collapse on me with Funky, I would resort to things like writing the talking leaves on the tree to help help me recoup a little time on the dreaded deadline doom. Written as they were out of complete and utter desperation, it would always amuse me when readers would cite them as some of their favorite strips. Much of that probably stems from their cyclical nature when they, much like Charlie Brown’s football, would return each year to announce the arrival of Fall. Kind of like a summer catch-up annual.